Roman Pickl from FLUIDTIME attended the ITS World Congress in Montreal giving a speech at SIS114 – Mobility as a Service: New Business and Service Approaches about Enabling the MaaS ecosystem. Mobility as a Service solutions will put users at the heart of the transport network, offering tailor-made travel services based on their preferences. MaaS has the potential to become the mobility service of choice for future generations, disrupting the traditional link between mobility and vehicle ownership. It will provide the means to achieve the smarter, simplified transportation landscape envisioned and expected by future users. This session examined the current status of development and deployment as well as the different approaches being applied. The discussion dealt also with the industry, city, and regional perspectives of MaaS as well as focused on developments in business, service, and policy aspects of this trending topic and the partnerships that are delivering them. 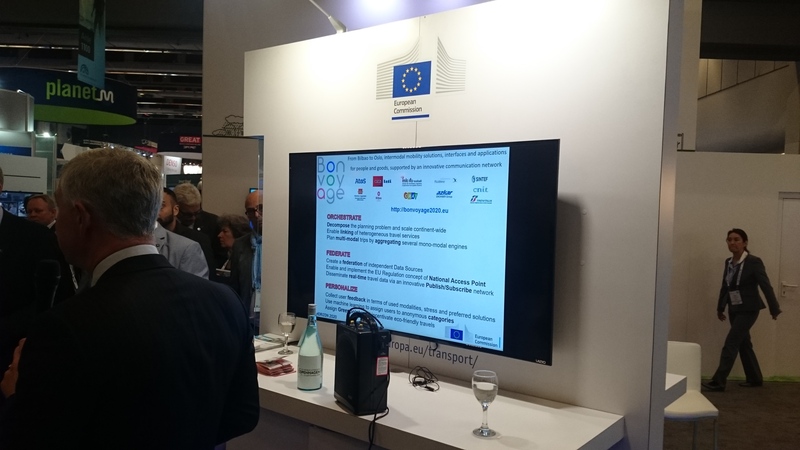 Bonvoyage project was presented as part of a slideshow showing H2020 projects at the European Commission Booth.